Valentines Day is coming up and if you're like me, you don't like to hassle with the crowds and the prefixed menus at the restaurants, but it's hard to come up with unique ideas to celebrate this holiday with your significant other so you end up settling. If you're having this problem, don't worry! We have found the best DIY Valentines Day Date ideas to make your special someone swoon. Let us know what you think! 1.) Paint and sip. - Most of us are so consumed with our busy schedules that the last time we expressed our creative side was art class in grade school. Take a trip back to childhood with the paint and sip date night. Pick up some paint, paint brushes, and a couple of canvases from your local dollar store or hobby lobby. Find a picture online that you would like to paint (or paint a picture of each other for a funny night) and print it out. Get a couple of bottles of your favorite wine, light some candles, and get to painting and sipping. Don't let each other see the other's work until you're done. This is a great way to bond, laugh, and enjoy some together time away from technology. 2.) Netflix and Chill- we all love our share of Netflix and now you can indulge your Netflix addiction on Valentines Day with this romantic spin by creating a cozy romantic hideout. You may feel like a kid again making a fort in your living room out of sheets, but adding some lights and some champagne makes this fort adult friendly. 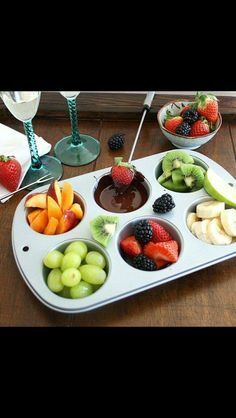 For a delicious snack while you're both catching up on your favorite shows, simply cut up some fruit, melt some semisweet chocolate with a little bit of butter in the microwave, and arrange in a muffin pan. Grab some skewers or forks and you have the perfect Valentines day fondue. 3.) S'mores by the campfire- Who doesn't love a good s'more? Create your own romantic campfire by placing a couple of scentless candles on a tray on the floor. Surround the space with some comfy blankets and pillows. Place candles all around the room to create a romantic atmosphere. Grab the ingredients for s'mores and arrange it on a plate and begin to roast the marshmallows over the scentless candles on the tray. Enjoy Valentines day by enjoying America's favorite treat! Newer Post4 incredible Super Bowl Sunday recipes! Older PostNeighborhood of the Year 2016!